This application brings together the many compelling platform capabilities of Silverlight 4 into a rich out-of-browser application in the familiar context of Facebook. 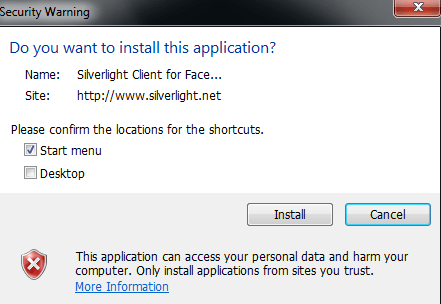 In order to install Silverlight Client for Facebook, you will need to install the Silverlight 4 beta first. If you installed the tools above, you will get the developer runtime and there is no need to install again. These downloads are being made available for test machines for the Windows and Mac platforms for your applications. Once you agree the license agreement and click on install, The installation progress bar will reach its 100% and then show the below dialog. This defines the entry point (shortcuts) for the application. You can choose Desktop Shortcut, if you need. Once the installation completes and you launch the application shortcut, you will need to authorize this Client to fetch your Facebook feeds and images. You can enter your credentials and authorize. Once the Authorization is done, the home screen of the Facebook client Appears. You will see the Silverlight Ui richness. This is a typical Silverlight app, which gives this client an Out of Browser Xperience. 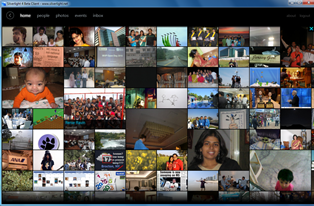 The photo album looks more attractive, and it immediate pulls out a collage of pics. You can choose one and view it as well. When you select Events tab, now you have an option to sort the events upon dates, sort by month, and even the past events. I loved the calender view in this client. Also when you click on the People/Friends tab, it now gives you a alphabetical order of all your friends. You can select a friend, and his feed will appear on the right side. This is one of the Sooper Cool feature of this client. The last funntasstic feature is the inbox., The messages in this client looks quite similar to that of an email chain. More good, the live feeds of the other person who had messaged you, appears in the right side. This is an amazing feature. 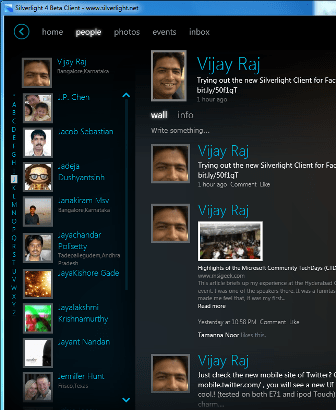 Silverlight Client for Facebook is a Silverlight 4 developer preview application. When Silverlight 4 is finally released you may be required to uninstall and re-install the plugin! Enjoy the photos, feeds, events, friends’ walls, and inbox mail from your Facebook account in an appealing and user-friendly environment! 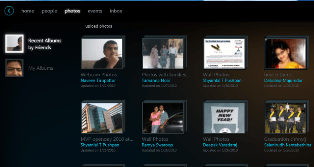 Posted in General, How-to, Microsoft, Tools and tagged facebook, howto, Silverlight, Softwares. Bookmark the permalink.